Between 10 percent and 30 percent of patients undergoing a stem cell transplant develop new-onset diabetes. 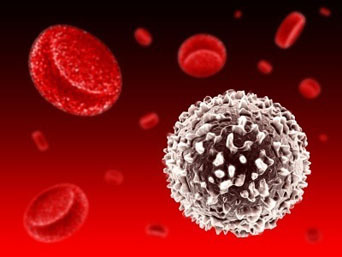 Immunosuppressive white blood cells, called Tregs, are implicated in the prevention of autoimmune diseases (like type I diabetes) as well as the inhibition of alloimmune responses, like “graft-vs.-host disease” (GVHD), a common adverse effect of stem cell transplant. Brian Engelhardt, M.D., James Crowe Jr., M.D., Madan Jagasia, M.D., and colleagues assessed the role of Tregs in post-transplantation diabetes mellitus (PTDM) in patients who received stem cells from a related or unrelated donor. They report, in the March 8 issue of Blood, that the balance of Treg subtypes in these patients was disturbed: transplant patients with new-onset diabetes showed a decrease in skin-homing Tregs, but an increase in gut-homing Tregs. Predictably, PTDM was also associated with skin GVHD but not gut GVHD. The results suggest that targeting PTDM and related metabolic disruptions could modulate abnormal immune responses like GVHD and improve clinical outcomes after stem cell transplant. The research was supported by grants from the National Cancer Institute, the National Institute of Child Health and Human Development, and the National Institute of Diabetes and Digestive and Kidney Diseases of the National Institutes of Health, the American Cancer Society, and the Sartain Lanier Family Foundation.